The interlocking brick pavers are laid on a bed of clean (or very lightly stabilized) sand which in turn is laid on a protective/isolating membrane such as Interdek or pvc sheeting. Provision for differential movement is to be made at all abutments and throughout large areas - this is achieved by creating an open or soft joint at regular intervals and at all abutments. In those areas where continuous high traffic flow is anticipated, special precautions are to be taken to ensure that the paving is packed in such a way that it prevents excessive movement of the brick paving. Under normal conditions, this form of protection wearing surface has proved to be highly successful. Minimal stress placed on the waterproofing. Simple access in the event of damages or subsequent modifications. The waterproofing membrane is turned up at edges to a level higher than the finished paving level. 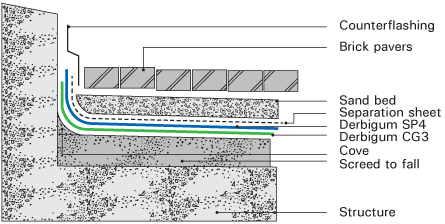 A soft-joint is to be formed at all abutments so as to accommodate movement in the brick paving thus avoiding damage to the waterproofing membrane. It is recommended that a 'header' course be laid at abutments to achieve a uniformly wide 'soft-joint'. One layer Derbigum SP4 on one layer Derbigum CG3 waterproofing membrane, laid staggered, with 75mm side laps and 100mm end laps, sealed to primed surface by “torch-fusion”, followed by a layer of Derbigum Interdek with 50mm laps or a layer of 250 micron plastic sheeting, loose laid on waterproofing as isolation/protection layer, to receive brick paving on sand bed (elsewhere specified). Waterproofing to be installed by an Approved Derbigum Contractor under a ten year guarantee. The integrity of the waterproofing should be established by means of a flood-test of 48hrs – 72hrs duration, prior to handing over to the contractor. A certificate is to be obtained from the professional team recording the date and time-period of the test and that the waterproof treatment was handed over in a clean, proper and watertight condition.